All of us here at The Blockade Runner were horrified to hear last week that Kelly Marie Tran left Instagram/social media seemingly as a result of the disgusting harassment she’s been facing since she was cast in The Last Jedi. Inspired by Rose’s statement to save what we love instead of only fighting what we hate, we decided to put together an episode celebrating Rose and Kelly Marie Tran herself. Luckily the wonderful Laura Sirikul agreed to join us for this one, and we’re so glad she did! Laura has been a fan of Rose and Kelly since Lucasfilm first announced the character’s involvement in The Last Jedi; she’s the first fan to cosplay as Rose and has met Kelly Marie Tran too, so she’s the perfect person to help us celebrate one of the best parts of one of the best Star Wars movies! We start out by addressing the harassment and cruelty that toxic Star Wars fans (or whatever they are) have been spewing at Kelly Marie Tran, Kathleen Kennedy, and Rian Johnson in response to The Last Jedi before discussing some of the positive and inspiring reactions from the fan community. Then we spend the rest of the episode exploring the qualities and characteristics that make both Rose and Kelly Marie Tran such incredible new additions to the Star Wars universe. Categories: Episode IX, Episode VIII, Podcast Episodes, Podcasts, The Last Jedi, Video | Tags: Kathleen Kennedy, Kelly Marie Tran, Rian Johnson, Rose Tico, Star Wars, Star Wars Podcasts, The Last Jedi | Permalink. After the Disney deal went through and the canon “rebooted,” I made a commitment to start fresh collecting Star Wars comics in earnest. I had a handful of original Marvel books and kept up with the Dark Horse titles for a few years, but I was never fully able to catch up (same with the novels, etc.). The continuity reorganization gave me a fresh starting point and as of this moment I’ve read pretty much every Star Wars comic published since the change. I love what Marvel, IDW, and the Lucasfilm Story Group have been doing with the comics, bringing in some of the absolute best talent in the industry to tell great stories that compliment the films. 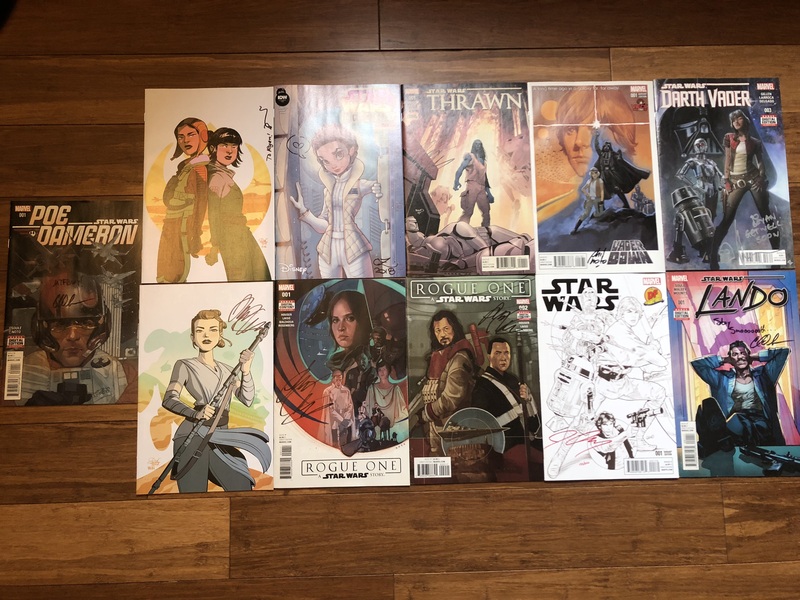 I’ve been fortunate enough to meet some of this talent at various conventions over the past few years, and it has been great to be able to let them know how much I appreciate the work they’ve been doing (and to get signatures for my collection). So that’s what this post is all about, just sharing the books I’ve had signed and my appreciation for the creators. Categories: Comics | Tags: Comics, IDW, Marvel, Star Wars | Permalink. John and Ryan discuss their evolving opinions of Solo after each saw it for a third time this weekend. Then share our favorite parts of Pablo Hidalgo’s Solo: A Star Wars Story – The Official Guide book. Categories: Blockade Runner Video, Books, Podcasts, Solo: A Star Wars Story, Video | Tags: #SoloAStarWarsStory, Solo, Solo: A Star Wars Story, Star Wars Books, Star Wars Podcasts | Permalink. We’ve posted two Solo reactions shows this week, both linked below. The first features our immediate reactions after seeing the movie on opening night. All of the Blockade Runners located here in Illinois headed out to a local bar after seeing the movie and recorded our first impressions. Ryan joins John to discuss his feelings about Solo after two viewings. We go through Ryan’s highs and lows and find some common ground between our two pretty different takes on the movie. Ryan also shares his Alamo Drafthouse screening of Solo and his run through the Millennium Falcon Experience. Categories: Blockade Runner Video, Podcasts, Solo: A Star Wars Story, Video | Tags: #SoloAStarWarsStory, Chewbacca, Chewie, Han, Han Solo, Lando, Lando Calrissian, Podcasts, Solo, Solo: A Star Wars Story, Star Wars Podcasts | Permalink.